Roger Palmer 1634-1705, first Earl of Castlemaine, was a prominent Catholic. 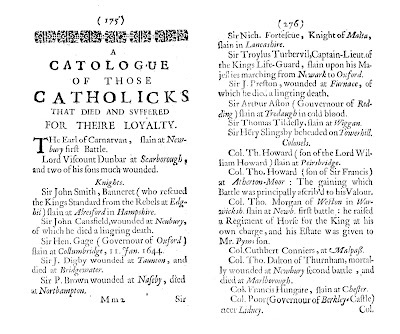 In 1668 he published the second edition of A reply to the ansvver of the Catholiqve apology, or, A cleere vindication of the Catholiques of England from all matter of fact charg'd against them by their enemyes. 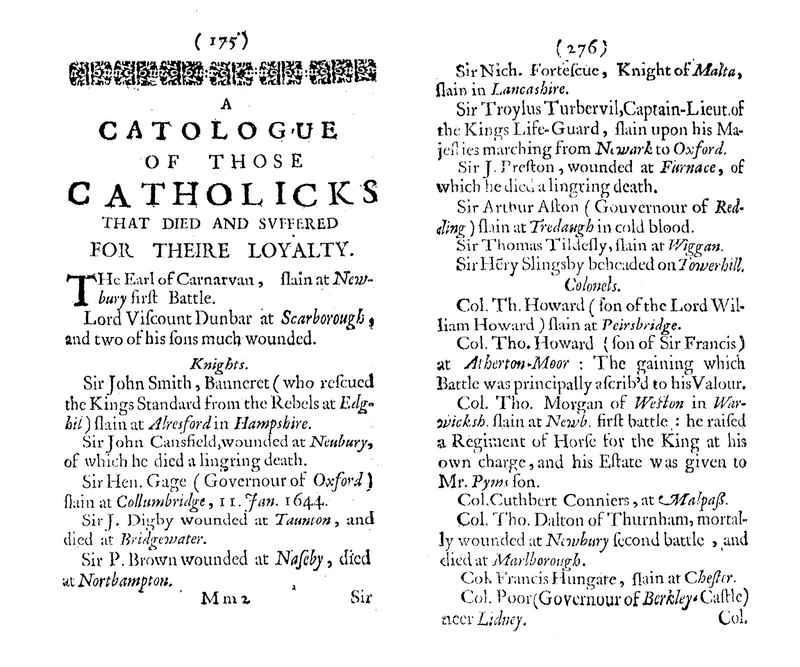 A CATOLOGUE OF THOSE CATHOLICKS THAT DIED AND SVFFERED FOR THEIRE LOYALTY. THe Earl of Carnarvan, slain at Newbury first Battle. Lord Viscount Dunbar at Scarborough, and two of his sons much wounded. Sir John Cansfield, wounded at Neubury, of which he died a lingring death. Sir Hen. Gage (Governour of Oxford) slain at Collumbridge, 11. Jan. 1644. Sir J. Digby wounded at Taunton, and died at Bridgewater. Sir P. Brown wounded at Naseby, died at Nortbampton. Sir Nich. Fortescue, Knight of Malta, slain in Lancashire. Sir Troylus Turbervil, Captain-Lieut. of the Kings Life-Guard, slain upon his Majesties marching from Newark to Oxford. Sir J. Preston, wounded at Furnace, of which he died a lingring death. Sir Arthur Aston (Gouvernour of Redding) slain at Tredaugh in cold blood. Sir Thomas Tildesly, slain at Wiggan. The Names of such Catholicks, whose Estates (both Real and Personal) were sold, in persuance of an Act made by the Rump, Iuly 16. 1651. for their pretended Delinquency: that is, for adhering to their King. IOh. Lord Marquess of Winchester, who so valiantly defended Basing-house. Henry Lord Marquess of Worcester, who has been at least 300000. l. looser by the War. Marmaduke L. Langdale, and his son. Sir Thomas Tildesly himself slain, and his Estate sold. Sir Hen. Slingsby, beheaded at Towerhill, and his Estate sold. Sir Piercy Herbert, now Lord Powys.